Thrive Foods: 200 Plant-Based Recipes for Peak Health is a cookbook created by professional Ironman triathlete, Brendan Brazier. It is based on the nutritional philosophy Brazier introduced to the public in his first book, “Thrive”, which involves an emphasis on eating a high amount of nutrient-dense plant-based foods in order to improve health and reduce stress. Brendan Brazier educates readers about the importance of consuming foods that have a high proportion of nutrients in comparison to the calories they provide. 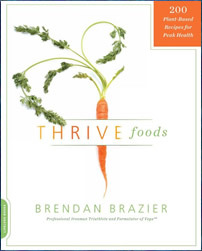 Thrive Foods includes 200 plant based recipes contributed by award-winning restaurants and highly regarded chefs, as well as recipes specifically designed to improve athletic performance that are provided by Brazier himself. All of the recipes utilize highly nutritious plant-based ingredients and are gluten-free. Many of them also include superfoods such as acai berries, chia seeds, hemp seeds, spirulina, chlorella and maca. Some of the recipes featured in the book include Blueberry Pancakes, Walnut Cranberry Energy Bars, Pumpkin Gnocchi, Spicy Black Bean Chili, Quinoa Falafels, New Caesar Salad, Indian-Spiced Lentil Hemp Burgers, Chocolate Goodness Smoothie, Key Lime Pie and White Chocolate Raspberry Cheesecake with Chocolate-Almond Crust. A large section of Thrive Foods is devoted to discussing the connection between our food choices and the impact on the environment. Brazier clearly illustrates the differences between a standard American meal plan, a “healthy” American diet and his Thrive whole foods way of eating in relation to carbon dioxide emissions. By eating in accordance with his suggestions you can do more to mitigate climate change than eliminating driving your car altogether, he says. Lettuce, kale, spinach, asparagus, broccoli, carrots, celery, zucchini, pumpkin, sweet potatoes, buckwheat, quinoa, wild rice, brown rice, flaxseeds, hemp seeds, sesame seeds, sunflower seeds, almonds, macadamia nuts, walnuts, black beans, chickpeas, lentils, dates, acai berries, coconut oil, extra-virgin olive oil, flaxseed oil, ginger, coconut sugar, kombucha, green tea, yerba mate, stevia. Thrive Foods does not include exercise guidelines, however the author has another book, “Thrive Fitness”, which specifically addresses exercise and how eating a plant-based diet can improve physical performance. Thrive Foods: 200 Plant-Based Recipes for Peak Health retails at $20. Click Here to purchase Thrive Foods for a discounted price online. Encourages the intake of a high amount of fresh and unprocessed foods. Emphasizes improving health rather than simply losing weight. Includes 200 plant based recipes contributed by professional chefs. Suitable for those with allergies to foods including gluten and dairy. Addresses the importance of stress management and adequate sleep. Brings attention to the environmental impact of our food choices. May not appeal to those who don’t wish to eat a vegetarian diet. Will require more time to be spent preparing meals. Some of the ingredients are not available in regular grocery stores. Thrive Foods: 200 Plant-Based Recipes for Peak Health is an ideal companion to the author’s first book, “Thrive” and will appeal to anyone looking for delicious recipes that are suitable for a gluten-free or plant-based diet. Thrive Foods provides dieters with options for meals that are high in nutrients in relation to their calories, which will support the achievement of an ideal body weight as well as promoting optimal health.